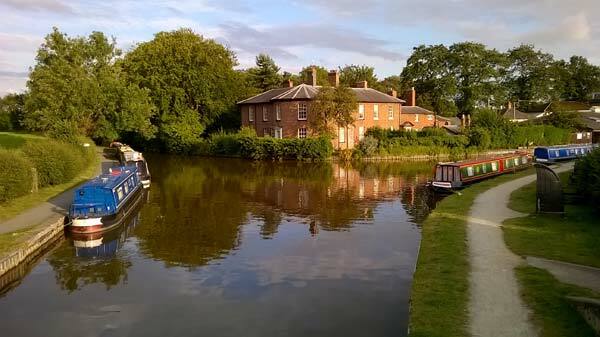 Ellesmere is an historic market town that takes its name from the nine lakes – or meres – around it. 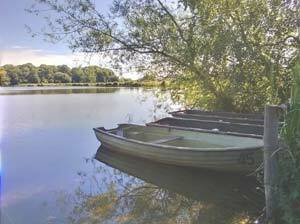 It’s Shropshire’s own mini version of the Lake District, and the largest mere, on the edge of the town – The Mere – has been recently re-modelled with The Boathouse, a visitor centre, arboretum, children’s play area and a park at Cremorne Gardens. After centuries as a backwater, the dawn of the 19th Century saw Ellesmere come of age as a transport hub between the Midlands and the Mersey and the world beyond. The Ellesmere Canal saw the the town prosper and grow, and many of its fine buildings date from the 1900s heyday of the canal. Now Ellesmere is a hub for the booming canal tourist industry, though the canal is now better known as the Llangollen Canal. And what was once a bustling, noisy industrial town is now a rural haven. Ellesmere is a quiet town, but there’s lots for all ages to do, from walking and cycling on the towpaths and quiet lanes around the town, to boating and wildlife on the meres – have a look at the Heronwatch project and the Meres Meander Leaflet from Shropshire Council (PDF download) . 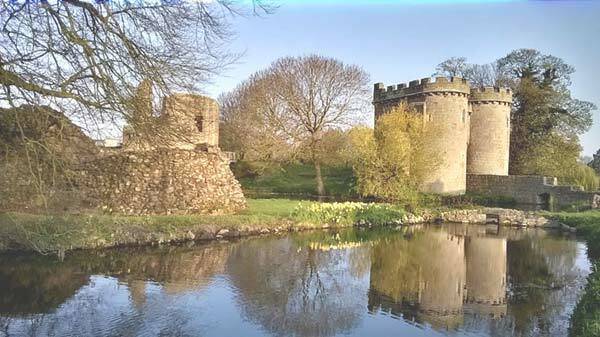 It’s in easy driving distance of the popular tourist destinations of Shrewsbury, Llangollen and Chester, as well as the rest of North Wales and, of course, Shropshire. On the canal theme (again), the World Heritage site covering Thomas Telford’s two aqueducts at Chirk and Pontcysllte is a must see. Unlike lakes, meres do not have water flowing through them, but depend on water draining from the surrounding land. The word comes from Anglo Saxon. 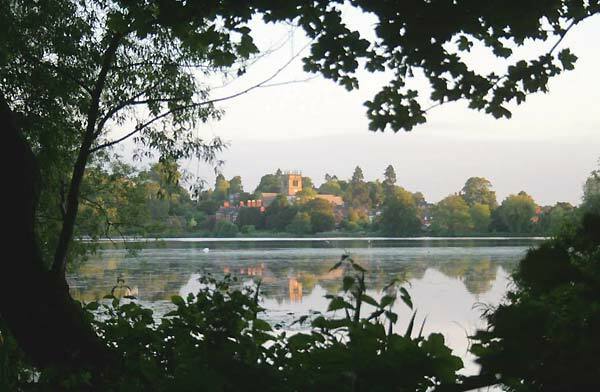 Ellesmere’s biggest mere – The Mere – sits on the edge of the town and is the largest natural lake in England outside of the Lake District. There are nine meres in all, and they were created at the end of the last Ice Age, when huge blocks of ice remained in the landscape and formed depressions in the ground, which then filled with water. The Mere also has an artificial island, created from land excavated during the creation of the gardens at Ellesmere House in 1812. It got its name – Moscow Island – from the retreat of Napoleon from Moscow in that year. 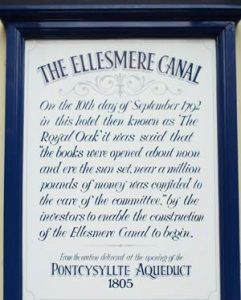 The Ellesmere Hotel – then the Royal Oak Hotel – played an important part in the canal coming to Shropshire. In 1792 the Duke of Bridgwater called potential investors to a meeting at the hotel to raise money for a new canal that would link Ellesmere with the tiny port of Netherpool. 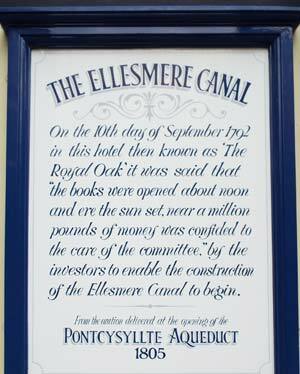 The fundraiser raised £1 million, an enormous sum in those days, and the Ellesmere Canal Company was formed. Ellesmere became a hugely important transport hub, and its terminal on the Mersey was renamed Ellesmere Port. This event led to the construction of the two aqueducts at Chirk and Poncysyllte, with the extension of the canal to Llangollen. Today they are a World Heritage Site and well worth a visit. The hotel was immediately renamed the Bridgwater Arms in honour of that night in 1796, a name it kept until it was re-named in the 1990’s to the Ellesmere Hotel.